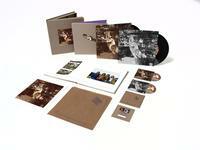 Led Zeppelin's In Through The Out Door Super Deluxe Edition! Audio newly remastered by Jimmy Page! The Super Deluxe Edition of In Through The Out Door features the remastered album on 180-gram vinyl, packaged in a jacket that replicates the LP's first pressing. The LP is accompanied by a companion LP comprised of previously unreleased music related to the original release, selected and compiled by Page. Other features of the Super Deluxe Edition include: Remastered album on CD in a vinyl replica sleeve, companion audio disc on CD in a card wallet, hi-res audio album download card, all content at 96kHz/24bit, a hard-bound 72+ page book filled with rare and previously unseen photos and memorabilia, and a high-quality print of the original album cover, the first 30,000 of which are numbered. On its release in the summer of 1979, In Through The Out Door topped the U.S. and U.K. album charts and has since been certified six-times platinum. Sadly, it would be the last album that Led Zeppelin recorded prior to drummer John Bonham's passing the next year. Among the seven album tracks are "Fool In The Rain" and "All My Love," two songs that remain rock radio staples to this day. The album's companion audio disc features an released rough mix of every track from the original album, including early versions with working titles such as "The Hook" ("All My Love"), "The Epic" ("Carouselambra"), and "Blot" ("I'm Gonna Crawl").